Levain Bakery in New York City makes the best giant dark chocolate cookies. Studded with peanut butter chips and not too sweet, the dark chocolate cookies are almost as good as their giant chocolate chip. This recipe was an attempt to replicate Levain’s cookies at home. Jessica from Su Good Sweets and Lisa from Parsley Sage Sweet were the first to make what in my opinion is the closest version. Using their version as a start, I made a smaller batch version. What type of butter you use (European style vs. American), brand of flour and how heavy handed you are when measuring it, type of cocoa powder (Dutch vs. Natural) and even your oven will influence just how big and fat your cookie will be, so use this recipe as a start and adjust as needed. I think one key thing with these cookies is they need to be underbaked slightly and allowed to sit for a while and cool internally. You can play with cook times, but I had good results using the ones that follow. In bowl of a stand mixer fitted with paddle, cream together butter and both sugars until well-blended. Add eggs and vanilla and beat just until incorporated, then scrape sides of bowl and beat in cocoa powder. Scrape sides of bowl again. In a separate bowl, thoroughly stir together flour, salt and baking powder. Stir the flour mixture into the chocolate mixture. When flour is mixed in, go ahead and fold in the chocolate chips and peanut butter chips. Divide into 10 equal portions ( you can make them larger or slightly smaller if desired). On a parchment paper or Silpat lined or non-stick cookie sheet (don’t use grease or spray), place the cookie dough mounds. Bake at 375 degrees for 8 minutes, then without opening oven or tampering with cookie sheet, reduce heat to 325 degrees and bake for another 8-10 minutes or until cookies appear set but still slightly moist in the center. If you have a convection oven, bake at 400 for about 8 minutes then reduce heat to 330 and bake for another 10 minutes or until the cookies have little cracks on the top. Let cookies cool on rack for about 5 minutes, then transfer to a rack to cool and set. I just recently found your wonderful blog. I saw a recipe reference for Brutti ma Buoni but when I clicked on it, the recipe didn’t come up. Would you be so kind as to tell me how I might get the recipe? The reviews were very interesting an I would love to try your recipe. I recently visited Italy and I brought back a package of these but they are very crunchy maybe because of shelf life. Thanks and all of your recipes sound yummy. These cookies turned out GREAT! I can’t wait for my husband to taste them. I made your small batch version and only have six cookies, but since they’re HUGE I’m thinking of putting them in the freezer until the kids are home. Mine aren’t quite as dark as yours. I used Droste Dutch processed cocoa, Reese’s PB chips, and Ghiradelli 60% cacao chips. Thanks for pointing me in this direction to use up the remainder of my PB chips. these are my favorite cookies and i get them whenever i’m in the area. anyway, they do not have chocolate chips. just straight up peanut butter chips. great the next day two after about 20 seconds in the microwave. thanks for the recipe. will give it a try. Carrie, whipped butter has extra air and water, so that would definitely change the texture. Thanks for posting this. I made them last night. They came out beautifully, but they were more cake-like than cookie like. All I had was whipped light butter so that might be the reason why? I doubled the recipe and made these today. Yum! I used my big Pampered Chef cookie scoop, but didn’t quite fill it all the way — I ended up with 24 cookies. I baked at 350 for around 12 minutes. They are pretty thick and don’t spread much — but I like them that way!! I didn’t have the dark cocoa, but plan on using that next time around. I think I will also try using half brown sugar and half white sugar. I love to experiment! Chelsea, the dryness might have something to do with your reduction in sugar. That’s all I can think of, really. Using too much flour or over-baking could also make them dry, but I doubt you did either of those things. Katy, thanks for posting Elinor’s recipe. I have Big Fat Cookies and all the recipes from it have been amazing. Dawn, who sometimes stops by, is Elinor’s tester. Catharina, thanks for stopping by. Tell your mom I said hi ;). Beth, I can’t answer your question without experimenting. You might want to just take a small portion of the dough and test it. For small cookies, I’d probably just cook at 375 for 8-10 min. Patricia, the Hershey’s European Style Cocoa is EXTREMELY dark….darker, I think, than most Dutch chocolate. So Indigo, did you make these or are you just going by the photo? I like your desert image…a Dessert Desert. Erin, that’s great news! I am already itching to make another batch of these. Jessica, I’ll email you regarding the weight/volume because reading about it will give people a headache. Hmm, a day later, and still crumbly. Actually, they’re a bit dry. Did I maybe not mix them enough? When I was making the dough it didn’t want to meld together to well. Oh well. I think next time I’ll add some liquid. First of all I hope you feel better Anna! Next I made these cookies yesterday and my hubby LOVES them!!! So thank you because I had not yet found a chocolate PB cookie that he has like yet. This coming from a man who eats pb right out of the jar for a snack lol. Anyway Feel better and thank you!!! Oh, WOW. These are like chocolate boulders! (I have a bizarre image in my head of a dessert in which everything is edible… these would be great big chocolatey rocks. I probably shouldn’t tell people all the images that come into my head if I don’t want to be strait-jacketed X__X) Amazing. They are really dark, Anna! YUM! Wow, I think I’ve just found my new favorite website! Thanks to my mom for passing on the link. Thanks for reporting back. These look so delicious. When I converted the weight measures to volume, I used charts in Bakewise (maybe another place too), assuming you measure the flour by the spoon and level method. I reduced the sugar to 1/4 cup! It *could* be a bit sweeter, but the candies pretty much cover it up. I put a handful of chocolate chips, reeces, and rolos. I also used wheat flour. They’re a bit crumbly, but maybe that’s from the flour. I finally posted the cookie cake recipe. I know I was bad and broke my promise, but I couldn’t stand posting a recipe which was sub-par. I also just tried your s’mores cookie recipe (with some minor adjustments) in the cookie cake pan, but it looks like I still need to play around with the baking time! LOVE Su Good Sweets, and love your new take on the cookies! They look so rich and satisfying! oh these look so awesome! I’m going to try them with a gluten-free flour mix; I bet they’ll transfer nicely. Chelsea, I used a hand-held mixer and it worked just fine. Just make sure the one you use has a strong enough motor to beat the butter. I suppose most of them do these days. If you cut the sugar, let me know. uugh, those look TOO good, especially when trying to cut down on sugar! Since it has all the chocolate in it, maybe I’ll try reducing the sugar to 1/3-1/4th cup. LOL, do you think a regular hand held mixer would be okay? I don’t have a paddle. Those look fantastic. I hope you don’t give up your Levain copycat recipe because I saw the Throwdown episode earlier in the week and I want one of those cookies. They look like they’re not overly sweet. I have a recipe that bakes up similarly to the Levain cookie but it has oatmeal in it. You drop it by 1/3 cups. I can’t wait to see what you come up with after you get to sample the real thing. I’ve baked your No-Fail bar cookies at least three times now using different mix-ins and they are awesome. Instead of using all brown sugar, I’ve been using half white and half brown. I like them better this way since I thought using only brown sugar was overpowering some of the different mix-in. Everyone I give them to asks for the recipe. Anna..thanks for the extra hints..it all sounds sooo good! I used cold butter and I beat it just until it came together and smoothed out. These cookies are so good and even better after they’ve sat around for a while. The ones in the picture are still kind of warm. 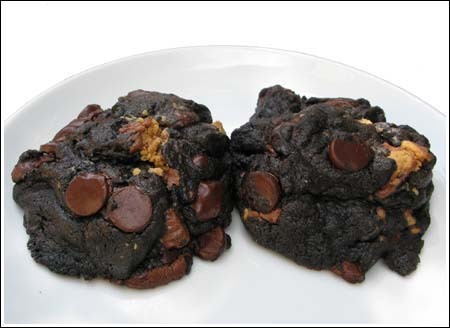 If Levain’s cookies are anything similar to this and if I were not such a baker, I would be at their store every week. These were just excellent and I used every day ingredients. Had I used something like Valrhona cocoa powder and Valrhona chocolate, my head might have exploded from all the chocolaty goodness. Also, the Reese’s miniatures were fine, but I think regular peanut butter chips or even big slices of peanut butter ribbon (from this blog) would work better. Another thing I’m interested in doing is adding a tablespoon or two of Guinness extra stout to the batter. I don’t know how much extra liquid I can get away with without ruining the consistency of the dough, but I think the flavor of stout might be unique. Oh, and of course there’s always the option of chopping up bits of flavored chocolate, in which case the sky is the limit these days. I need to get out of the house now. Fuzz has been at a birthday celebration all day and I haven’t used my free time very wisely. Those look amazing! Did you use cold butter, or room temp?